Dogs Tested On In Labs Feel Grass For The First Time. Cruelty Free Best Cosmetics. Always buy non tested cruelty free products. https://www.dolma-perfumes.co.uk/ – Fantastic – use all the time. https://bombcosmetics.co.uk/ – Just the best – especially for present packs – bath bombs etc. USA: Petition – Woman Hiding 44 Dead Dogs In Freezer Must Be Held Accountable. Goal: Prosecute woman accused of massive animal abuse. 44 dead dogs were allegedly found stored in freezers throughout the home of a Shamong Township, New Jersey woman. Police were called to the residence of Donna Roberts after months of neighbor complaints concerning an acrid smell emanating from the home. According to NBC, the township had to pass special ordinances in order to investigate. Once inside, officials reported finding over 100 animals living in their own waste, with no signs of care or clean up. Officers reportedly became dizzy and nauseous just from the toxic smell of the feces- and ammonia-ridden house. In all, 161 dogs were reportedly discovered in Donna Roberts’ residence, including the 44 dogs that were found wrapped in plastic bags in various freezers. Four of the animals were alleged to be in critical condition and were immediately shipped to emergency clinics. The rest of the surviving dogs have been vaccinated and are now being taken care of by six different animal shelters. Roberts has been released from custody and is awaiting trial. There is no information yet on how or why 161 dogs were found in her residence. 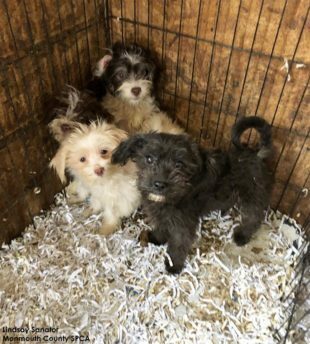 It is clear that whoever is responsible for keeping 161 dogs in a single-family home and forcing them to wallow in their own filth is guilty of a profound and disturbing act of animal cruelty and neglect. Please sign this petition to demand that these crimes be fully investigated and that Donna Roberts, if found guilty, be punished to the fullest extent of the law. 161 dogs were reportedly freed from the residence of Shamong County local Donna Roberts earlier this week. Local news claims that new county ordinances had to be passed just to be able to fully investigate a case of alleged animal neglect and cruelty this surprising. Police reported finding the dogs wallowing in their own feces and urine in an environment that reportedly made officers sick and dizzy from mere contact. Upon further investigation, 44 dogs were reportedly found dead and wrapped in plastic bags in various freezers throughout the house. Four other dogs were reportedly discovered in critical condition and immediately sent to emergency clinics. Donna Roberts was arrested and after being released on bail is awaiting trial. No motive or explanation has been uncovered for how 161 dogs reportedly became trapped in her single-family home. What is clear is whoever is responsible for neglecting so many animals, likely to the point of death in dozens of cases, is guilty of heinous animal cruelty and neglect. It is your responsibility to ensure this case is prosecuted to the fullest extent of the law. I demand that you fully investigate this case and request the harshest penalties for these heinous allegations. For this video I have – exceptionally – no comment.